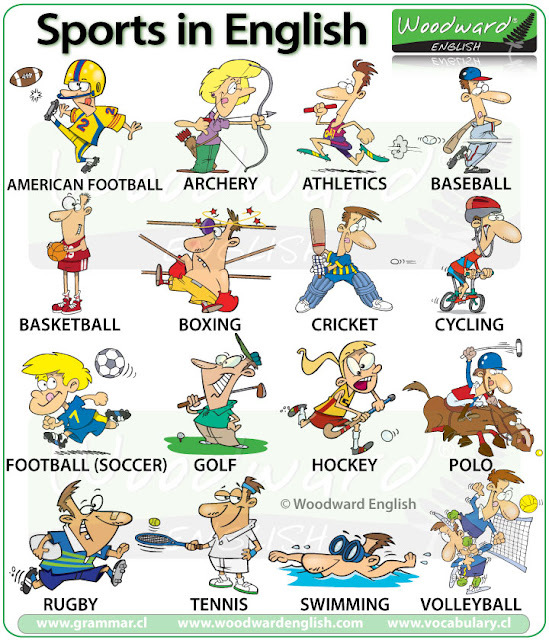 Mind angol: How do you play / do these sports? How do you play / do these sports? A racquet sport played by either two players (singles) or two pairs (doubles). Played on a court divided by a net with racquets and a shuttlecock. 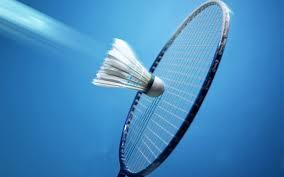 You play a game of badminton. A teamgame, usually played outdoors, on a cricket pitch, with a bat, a cricket ball, and stumps, There are11 players on each team. You play a cricket match. Darts is played by two players. Darts are thrown at a dart board. You play a game of darts or a darts match. A team sport, usually played outdoors, on a football pitch, with a round football, a goal, with two teams of 11 players, and a goal keeper (goalie). You play a game of football or a football match. Americans insist on calling it soccer. Usually played by individuals, golf is played on a golf course, using several types of golf clubs and a golf ball. You play a game of golf or a round of golf. A team sport, played outdoors, on a rugby pitch, with an oval rugby ball, and two teams of 15 players. You play a game of rugby or a rugby match. A racquet sport played by either two players (singles) or two pairs (doubles). Played on a court divided by a net with racquets and a tennis ball. You play a game of tennis or a tennis match. In baseball, you hit the ball with a bat – and the other players can catch the ball with a glove. You get points (which are called runs) by finishing running around all four bases. In American football, you get points by scoring a touchdown (running with the ball into the end zone) or a field goal (kicking the ball between the goalposts). BASKETBALL In basketball, you get points by making a basket – but the equipment itself is called ahoop.In tennis, you hit the ball with a racket, and in ping-pong you hit the ball with a paddle. HOCKEYIn hockey, you get points by putting the puck into the goal using your stick. Hockey players wear skates on their feet. In golf, you hit the ball with a club. Your objective is to put the ball into the hole. Football, which is a very fast paced game that is also played with an oval-shaped ball and the players use both their hands and their feet. In New Zealand, football may refer to the game of rugby, which involves an oval-shaped ball and fifteen players on each team. In the rest of the world,football usually refers to what we call soccer in Australia, New Zealand and the USA. 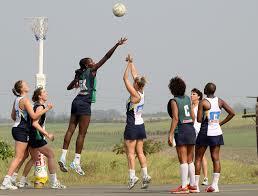 Netball - is a fast and skillful game that is played on a court that is divided into sections. It is played with a round ball that is approximately the same size as a soccer ball. The aim is to get as many goals as possible by 'shooting' the ball through the ring. A netball ring is similar to a basketball ring, but it does not have a backboard. Cricket - is played on a grass oval with a pitch in the centre. It is played with a small, hard ball, a wooden bat and wickets. The aim is to get more 'runs' that the other team. The game is divided into 'innings'. In the first innings, one team bats and the other team bowls, and then they change sides for the next innings. The batting team has two batsmen on the field and as they go 'out', other batsmen from their team take their place. The fielding team team has a bowler, a wicket-keeper and fieldsman who try to prevent the batsmen from making runs and who try to get the batsmen out. Cricket is the national sport of Australia and is the most popular sport during the summer. One of the most famous Australians - Sir Donald Bradman - was a cricketer and regarded as the best cricketer ever. They are the current world champions in both test match cricket (five day match) and one-day cricket. Cricket is very popular in other Commonwealth countries like England, South Africa, India and New Zealand. 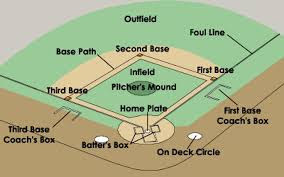 Baseball - is played on a 'diamond' with four bases - first, second, third and home. It is played with a rounded bat and a small, hard ball. The fielding team wear a special padded glove with which to catch the ball. The aim is to get as many home runs as possible by running around the diamond without getting 'out'. Basketball - is a very dynamic game where the players are often very tall and can jump very high! They use a round, bouncy ball and the aim is to get as many points as possible by putting the ball through the ring. You get a different number of points depending on how you get the ball through the ring. Gymnastics - requires enormous strength and flexibility. Gymnasts may perform exercises or routines of exercises on a slightly padded floor or on many other pieces of equipment, such as the vault, beam, high bar, uneven bars, parallel bars, rings and pommel horse. Judo, Kendo, Capoeira, Tae Kwon Do, Jujitsu, Aikido and many others. 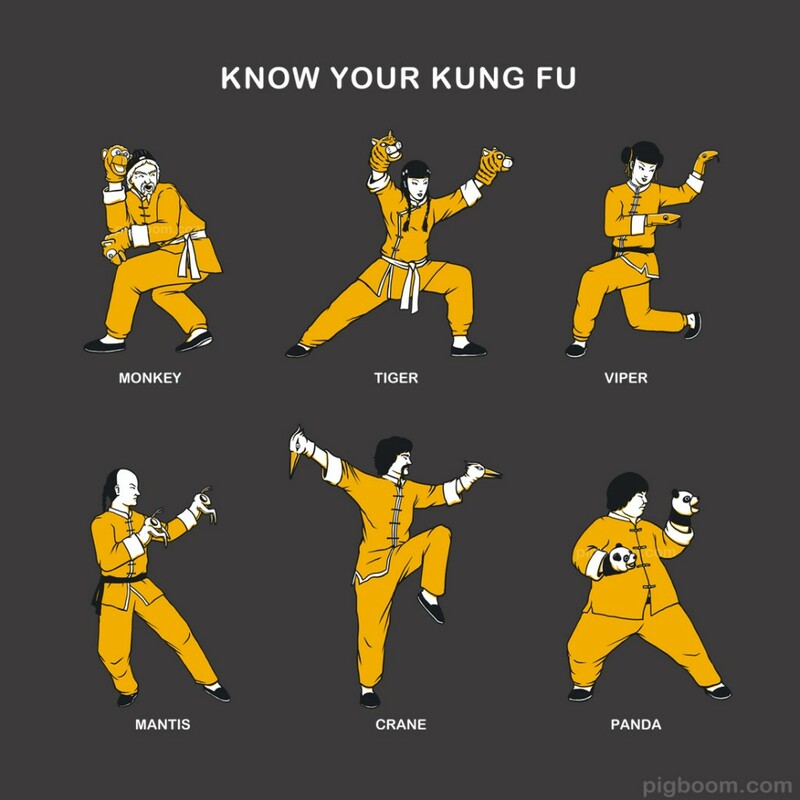 Martial arts usually have a very long and rich history and some also have spiritual or religious significance. They require a lot of discipline and practice to master them. 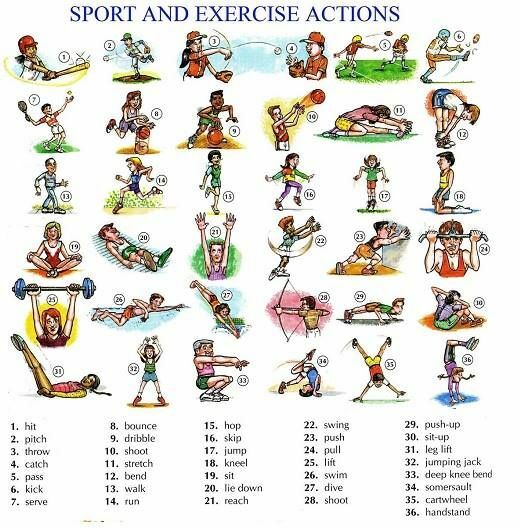 Athletics: (N) Athletics is the category for any track and field events, such as running (long and short distance), throwing the javelin, long jump etc. Swimming - There are many different swimming strokes that you can use to move your body through the water - freestyle (also called the front crawl), dolphin crawl, breaststroke, butterfly, backstroke, sidestroke and dog-paddle. When you swim, you can wear bathers (also called a swimsuit, swimmers or togs) or you can wear a wetsuit if you are going surfing or scuba-diving. You can also use equipment to swim, such as fins (also called flippers), a snorkel or an oxygen tank if you are going to stay underwater for a long time. Snowboarding and snow-skiing - Many people love winter because they can go snowboarding and skiing at the snow. In these sports, people attach skis or a snowboard to their feet and glide across the surface of the snow. There are many different types of skiing, including downhill skiing and cross-country skiing. Both skiers and snowboarders can also learn freestyle skiing or snowboarding, where they use jumps to perform acrobatic-style tricks. and 'hang' from a set of manmade wings. The hang-glider then runs along the ground and jumps off the edge of a cliff and the wings, like a kite, fly on the wind and carry the person along in the air. Without a motor, the glider cannot stay in the air for very long, but he or she can keep the hang-glider flying for as long as possible before directing it safely to the ground. Skydiving and parachuting - Many people love the excitement of jumping out of a plane and either free-falling for a time before opening their parachute (skydiving) or opening their parachute immediately after jumping so that they float more leisurely to the ground (parachuting). 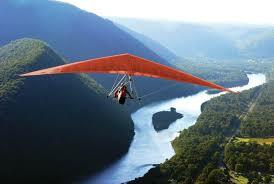 These sports are usually done in the open country where there is a lot of space for people to land safely. Horse-riding - You can ride a horse through countryside or along the beach to enjoy the scenery. You can ride your horse at a walk, trot, canter or gallop. You can enter dressage and show-jumping competitions where you display your horse-riding skills. The style of riding at these events is very disciplined and requires a lot of skilled communication with the horse. short, just two or three hundred metres, while others are longer, up to five or six hundred metres. Each hole has a tee-off area, or tee box, from which the first shot is played. Then a long fairway with short grass leads to a small area of very short grass called a green. There's is a small hole in the green called a cup in which a pinstands with a flag flying on it. The object of the game is to hit the ball and get it into the cup with as few shots as possible. But course designers don't want to make this too easy, so they build hazards into the course. On both sides of the fairway, and around the green, areas of long grass called the rough are usually found. Areas thick with trees and bushes are also common, along with hazards such as bunkers, lakes, creeks and gullies. Most golf courses have eighteen holes, though some only have nine. Players use one of several clubs to hit the ball towards the green, and then into the cup. Players carry up to fourteen clubs in a golf bag, or they have a caddie carry them. These clubs (see picture at right) include woods for long shots (on the left),irons for medium-length shots (top), and a putter for shots hit along the ground on the green (bottom). Players also carry their own score card, and record every stroke they play on each hole. 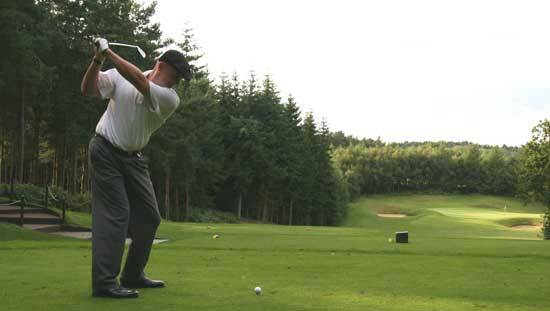 Each shot, whether it's a three-hundred metre drive or a two-centimetre putt, counts as one stroke.